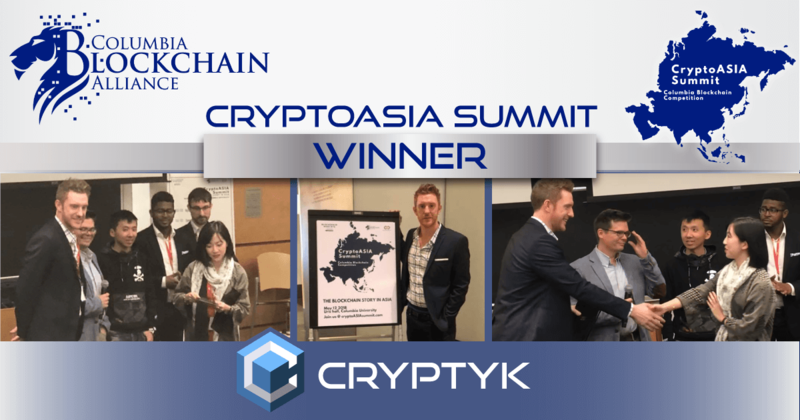 NEW YORK, May 12, 2018 – Cryptyk Inc is pleased to announce that it has taken out the first prize in the CryptoASIA Summit Blockchain Competition at the prestigious Ivy League school, Columbia University. Facing off against 9 shortlisted blockchain organizations, Cryptyk advisor Luke Lombe, presented a 5 minute pitch introducing Cryptyk’s innovative approach to cloud file management and storage. The judging panel included some noted blockchain experts and speakers and attendees included Huobi Labs, Jinse Finance, aand 8 Decimal Capital. As the main prize winner, Cryptyk received a prize package including a cash reward, a high-value ICO consultancy package from leading Chinese advisory firm, RedNova, and a number of tokens from other competing ICOs. Cryptyk CMO, Luke Lombe, said “we are thrilled to win the competition against some very high quality blockchain companies. This is excellent validation that reaffirms the strength of Cryptyk’s plan to disrupt the cloud storage, data management, and cyber security industries ”. Cryptyk CEO, Dr. Adam Weigold, CTO, Raghu Kotha, and advisor Luke Lombe are in New York City participating in the Blockchain Week of activities centered around Consensys. Join our growing community discussion and track updates on our channels. © Legal Information - Cryptyk Inc is a company incorporated in US, Nevada. Cryptyk, CTK, Cryptyk Vault, Cryptyk Sentry and Cryptyk Blockchain are registered trademarks of Cryptyk Inc.
All images, content and media on this site are either property of Cryptyk or public domain.